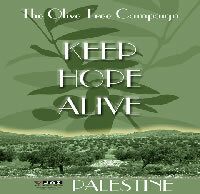 The Joint Advocacy Initiative together with the Alternative Tourism Group (ATG) are organizing the 10th annual Olive Planting Program – February 2017, as part of the JAI ongoing Keep Hope Alive – Olive Tree Campaign, to help Palestinian farmers and their families plant olive trees in their threatened fields. The cost of the program including accommodation in a double room, meals, guides, local transportation and other relevant expenses is $700. Requesting a single room at the hotel would cost the participant $200 Extra. Any extra night(s) accommodation (before the night of the 4th/5th of February, or after the night of the 12th/13th of February 2017) can be arranged with extra costs. Travel from and to the airport is NOT included in the cost but can be arranged for groups and individuals (350 NIS per person for each drive). Please fill and submit the Registration Form AFTER booking your ticket, in order to fill your arrival and departure information in the same record. Joint Advocacy Initiative of the East Jerusalem YMCA and the YWCA of Palestine, campaigns officer, via email at: olivetree@jai-pal.org or by phone at (+970) 2 2774540. Alternative Tourism Group, program coordinator, via email at: jawad@atg.ps or by phone at (+970) 2 2772151. Saturday, Feb. 4, Day 1: Arrival to the airport and travel to Bethlehem to meet representatives from the organizing institutions for an overview of the program, remarks, and briefing about the JAI and ATG. Dinner. Sunday, Feb. 5, Day 2: Guided tour in Bethlehem: site-seeing, introduction to the town, Wall, Refugee camp tour, Bethlehem old city, Church of Nativity. Monday, Feb. 6, Day 3: Half day planting trees at selected field, followed by lunch. Afternoon presentation and discussion with BADIL Resource Center for Palestinian Residency and Refugees’ Rights. Tuesday, Feb 7, Day 4: Visiting East Jerusalem: A tour in the old city of Jerusalem to visit the main sites in the city. Lunch. In the afternoon there will be a guided tour to witness settlements, house demolition and beduins in Jerusalem with Israeli group/activists. Wednesday, Feb. 8, Day 5: Half day planting trees at selected field, followed by lunch. Geopolitical presentation on the Israeli Apartheid Wall and land expropriation by Israeli authorities. Thursday, Feb. 9, Day 6: Day in Ramallah: visit Birzeit University, Right-to-Education Campaign, visit to and meeting with the public committee in village near Ramallah. Free time in Ramallah. Back to Beit Sahour. Dinner and free time. Friday, Feb. 10, Day 7: Half day planting trees at selected field, followed by lunch. Afternoon visit to an olive wood carving factory/workshop. Late afternoon advocacy and future work session with the Joint Advocacy Initiative. Saturday, Feb. 11, Day 8: Hebron Day: A tour in the old city of Hebron to visit the Ibrahimi Mosque, es-souq (the market), and to see the Israeli division of Hebron and the Israeli settlers who occupy the center of the city. Visit Scarfs (Koufiyyeh) and Glass factories. Sunday, Feb. 12, Day 9: Half day planting trees at selected field, followed by lunch. Afternoon general comments and evaluation session, followed by a musical evening and farewell with staff members and volunteers. Overnight in Bethlehem. Monday, Feb. 13, Day 10: Departure. Organised by the Joint Advocacy Initiative of the YMCA and YWCA in Palestine and the Alternative Tourism Group.